Whittle down the daily chore list and contribute to breast cancer research at the same time with the Pink Mini Dozier Hunter Folding Knife from KA-BAR. KA-BAR is joining the fight against cancer, 10% of the proceeds from every Mini Dozier purchased goes directly to the Roswell Park Cancer Institute to aid in the development and progress of breast cancer research. 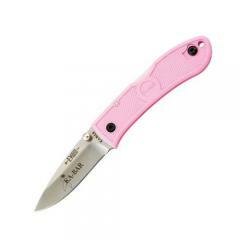 The knife is constructed from a pink Zytel material for lasting durability and a look that is sure to stand out. Measuring less than four-inches closed and featuring a sturdy AUS 8A stainless steel blade, the knife is ideal for everyday carry. The lockback mechanism secures the blade while in use and prevents accidental injury. With each knife sold, the cure for cancer gets a little bit closer. Join KA-BAR in the march to help nearly 200,000 Americans affected by the disease annually.